Here is the homily preached at St. John Parish in Clonmel for the 33rd Sunday in Ordinary Time [Year B], November 15, 2015. Every person is different. People have different likes, different dislikes; different tastes in food or music. And without a doubt, people have different… fears. Just a few weeks ago, on the last day of October, the culture around us made a celebration out of fear. In some ways, this can be a healthy thing, if we use it as an opportunity to make fun of ourselves, and to make fun of our fears: to put things into perspective, and even to realize that so many of the things that seem frightening, are not really things that we need to be fearful of. We need this, because every child—and every adult—has his own dragons, so to speak, lurking in the human imagination. And like in the legend of Saint George, the soldier who traveled through ancient England slaying dragons, we would like to find someone to slay those dragons. Every person fears different things. Some people, for example, find birds very scary. I remember being in junior high school at Goddard, and our class won some sort of contest. As a prize, our class got to spend an afternoon watching a movie on a huge screen in the gym (very novel back then). I’m not sure who chose the movie, but the movie that was shown to us was Alfred Hitchcock’s The Birds. If you’ve seen this movie, you know that it’s hard—after watching it—to see a flock of birds in the sky and not wonder if they’re going to swoop down on you in attack mode. An irrational fear, maybe, but a hard one to shake from your imagination, once it’s in one’s imagination. …because, we know that—yes, it is possible for a flock of birds to swoop down, and attack, like we saw in the movie. And our imagination seizes on that fear of what is possible, and blows it out of proportion—making it larger than life—until it paralyzes us. Some people fear heights, or falling from a high place. This is one of my own worst fears. My last four years preparing to be ordained a priest were spent at a seminary just outside of Chicago. When we had a free day on the weekend, those of us who weren’t locals would go into the big city to see the sights. Of course, one of the first sights that a person has to visit in Chicago is the John Hancock Observatory, on the 94th floor, one thousand feet above the ground. When you look out the huge windows of the Observatory, you have a literally awesome view of Chicago and Lake Michigan. It takes your breath away. But if you’re afraid of heights, it also takes your breath away physically. Of course, you could actually pound on that glass all you want: no normal person is going to fall through that window. A fear of falling from up in the Observatory is irrational. But the human imagination seizes on what is possible, blows it out of proportion—making it larger than life—until it paralyzes us. Some people are afraid of spiders, even those that are completely harmless. Other people are afraid of snakes, even those that couldn’t hurt a human being if they tried. The problem with all these fears which haunt us is not so much the things that we fear (even if there’s a kernel of truth there). The problem is our own imagination, and the power that it has. Every person fears different things. But there is one thing that every person fears deep down inside. Not every person fears snakes, or spiders, or heights, or birds. But every person fears death. Not everyone allows himself to think, to reflect on what death really means. We bury those thoughts, down deep. But those thoughts are there, in every human soul, from the moment we begin to exist, as an effect of Original Sin. The human imagination is one part of the human soul. And the fear of death dwells in every part of the human soul, including the human imagination. The problem is that when your imagination seizes on the thought of death, it can blow out of proportion the power that death has, and paralyze you. But it’s not entirely bad that that fear is there, inside. Because it is possible that death will end your life completely… if you do not turn to something that is larger than life, and larger than death. What the fairy tale offers the child as an idea, the Church proclaims and celebrates as a truth. This is why the Church can use the words “funeral” and “celebrate” in the same sentence. The Church does not just “conduct” a funeral, or “lead” a funeral. The Church celebrates a funeral Mass, because the Catholic funeral proclaims that for the faithful Christian, the deepest fear that dwells inside him—the possibility that death brings an end to everything that’s important to us—is a false one. Jesus has killed the power of death over the souls of the faithful departed. 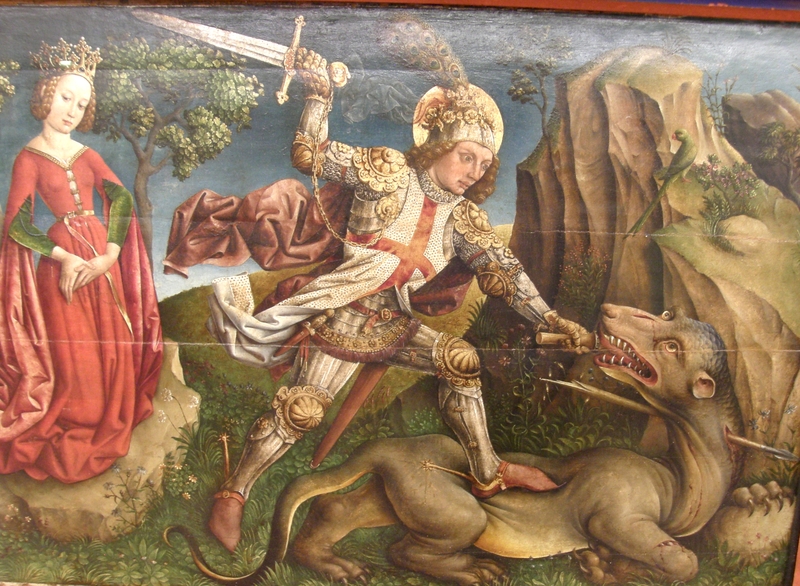 Jesus is not St. George, a soldier. He is Christ the King, who rules from the Cross. Everyone who experiences the loss that comes from a death—everyone who perceives the empty chair, the sadness and tears that fill the eyes of loved ones, and the quiet that is forced upon a room by death—needs the beauty of the Church’s celebration of the funeral. The only other option is to be left alone with one’s own imagination, to try to make sense of those experiences of loss. “Many of those who sleep in the dust of the earth shall awake; some shall live forever, others shall be an everlasting horror and disgrace.